The objective of this project was to design a deep neural network allowing a quadcopter to locate a target of interest (person) in a series of images captured with it’s camera. 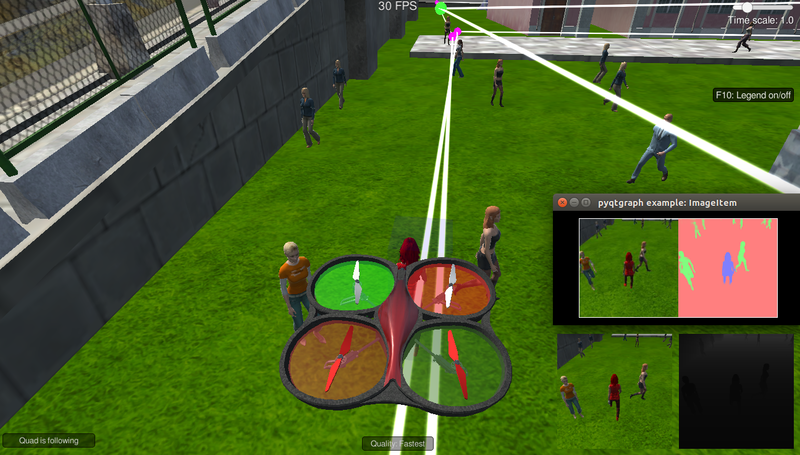 Using this information, the quadcopter is able to follow around the target in an environment populated with other virtual humans and objects. The image below shows the quadcopter following the target of interest, and the images processed by the neural network (right -“pyqtgraph”). The target of interest is denoted by a dark purple silhouette, while the other people are denoted by green silhouettes. The chosen architecture was a fully convolution neural network which resulted in a final score of 0.46 (above the base requirement of 0.4). This network was later used in simulation, to enable the quadcopter to follow the target through crowded and uncrowded areas in a virtual environment. You can find more details on this project in this repository. The objective of this project was to construct a perception pipeline to allow the PR2-robot to recognize specific objects in a cluttered environment for pick and place operations. The pipeline takes as input noisy data from the robot’s RGB-D camera and outputs .yaml files containing objects labels, their pick and place positions, and the arm to be used during these operations. 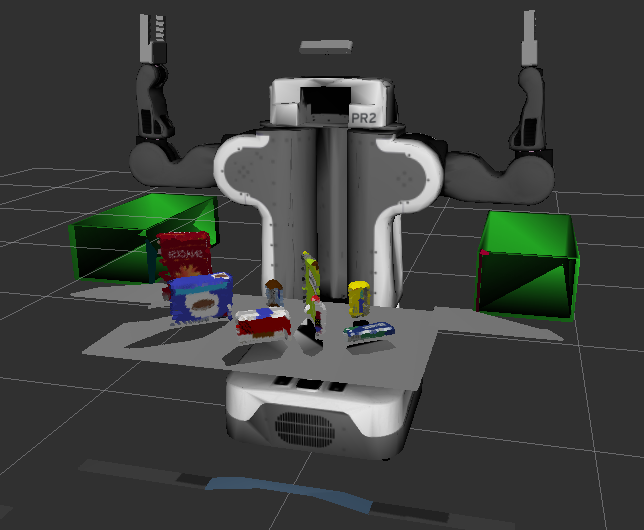 PR2 robot in an environment cluttered with different objects. Part 1: Filtering and RANSAC plane fitting to clean the image and isolate the region of interest. Part 2: Clustering for segmenting the scene into individual objects. 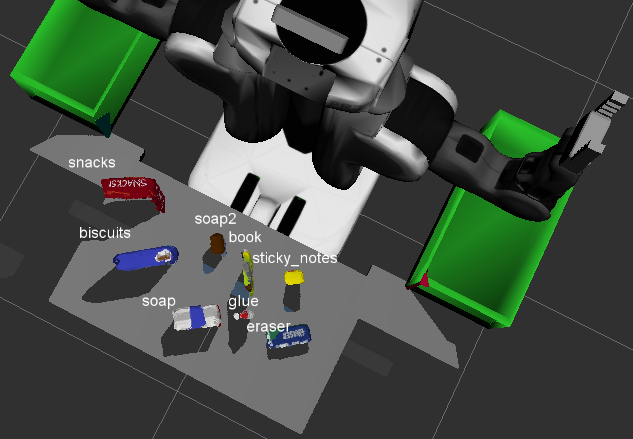 Given a list of objects to pick from the scene, the pipeline is used to recognize the desired objects and assign them labels. This information is later used to determine the object’s pick and place position and the arm to be used in this operation. PR2 robot recognizing objects in a cluttered environment. The objective of this project was to write an Inverse Kinematics (IKM) solver for the KUKA KR210 robot. This solver is responsible for computing the joint angles corresponding to a desired end-effector or gripper trajectory. 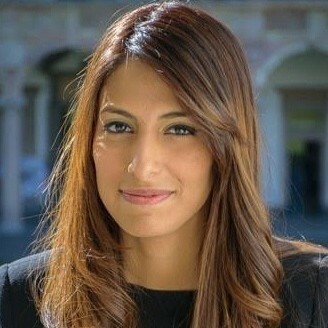 The algorithm was tested on pick and place operations, consisting of collecting objects from different locations on a shelf and depositing them on a bin. Kuka KR210 in a pick and place operation. Mathematical description of the robot’s geometry and determination of its DH parameters. Computation of its Inverse Kinematic Model (IKM): Since the robot has a spherical wrist, this problem was decoupled into an inverse position kinematic problem (to determine the first 3 joint variables), and an inverse orientation kinematic problem (to determine the last 3 joint variables). After implementing this analysis as a python script, the robot was tested in 10 pick and place operations (with different spawn locations). 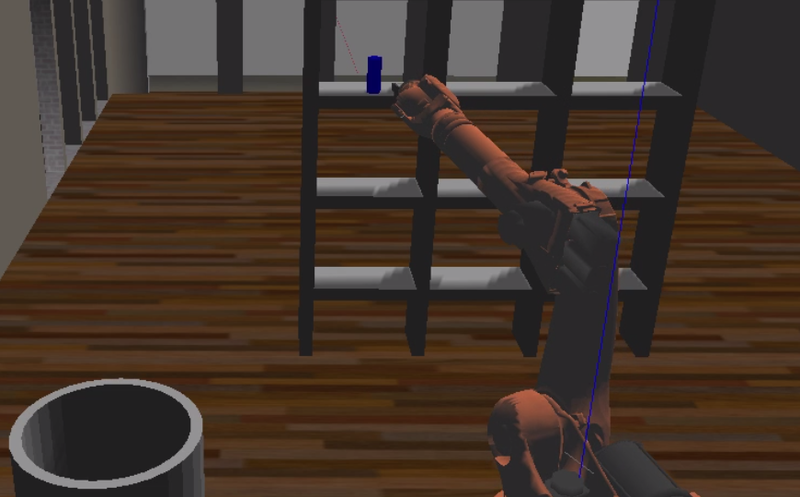 The results show that the robot is able to successfully pick and place the objects 9/10 times while following the desired end-effector trajectories. You can find the code and a detailed writeup of this project in this repository. This project was modeled after the “NASA sample return challenge”, its objective was to enable a rover to navigate autonomously in an unknown environment by developing its ability perceive and decide. To achieve this, two modules were developed: a perception and ad decision-making module. The perception module was used to detect obstacles, rocks (sample of interest), and navigable terrain based on computer vision techniques such as perpective transform, color space transformation, thresholding and distortion reduction. The following video shows how the rover is able to perceive the navigable terrain (blue), rocks (yellow), and obstacles (red) to update its worldmap. The decision-making module consisted of a decision tree which ensured obstacle avoidance and a wide exploration of the navigable terrain. After implementing the previous perception and decision steps. The rover was launched in autonomous mode several times. A mean of its performance was made over 10 trials with respect to the base requirements for the project (40% mapping at 60% fidelity). The rover is able to map at least 40% of the terrain with an accuracy of approximately 81% while finding at least a rock. The rover is of course capable of mapping more terrain and finding more rocks, but the previous statistics were computed to compare its performance with the base requirements. The following video shows the rover navigating autonomously while mapping 81% of its environment with 65% fidelity and several rock sample detections. You can find the code and a detailed writeup in this repository. ARACHNIS is a graphical user interface for the analysis and parametric design of Cable Driven Parallel Robots (CDPRs). This interface takes as inputs the design parameters of the robot, the task specifications, and returns a visualisation of a set of workspaces to assess the designs. These workspaces are the Wrench Feasible Workspace (WFW) and the Interference-Free Constant Orientation Workspace (IFCOW). The WFW is traced from the capacity margin, a measure of the robustness of the equilibrium of the robot. On the other hand, the IFCOW is traced via an existing technique for determining the interferences between the moving parts of CDPRs. Click here to download the latest verion of the interface. Priority 6: The rotational error of the moving platform should be smaller than 1 degree for a moment equal to 100 N.m about the axis passing through the geometric center of the moving platform and normal to the latter. For a detailed report on how the mechanism was designed just drop me an email. This research work was done within the framework of the project ENTRACTE (Anthropomorphic Action Planning and Understanding), winner of the Grand Prix de l’ANR and funded by the French National Research Agency. The objective of this project was to design simple and compact motion controllers for virtual characters by analyzing how humans control motion. To do this, experiments were conducted in which humans were asked to perform different motor tasks while muscle activity and kinematics were recorded. From this data, an analysis was done to extract the underlying control strategies (or synergies) using factorization and machine learning techniques. Such controllers were then adapted to command virtual characters in physics-based environments.